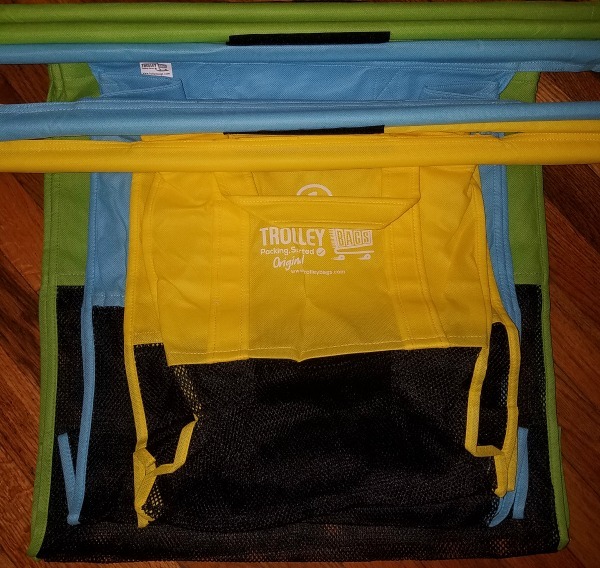 Trolley Bags are 4 different sized bags connected with velcro. They can be placed upright in a shopping cart to make grocery shopping easier. Trolley bags are helpful and also great for going green. We don't need to use all those plastic bags for our groceries. My local grocery store has a system where you can scan the food items and then place them in bags to make check out quicker. Using the Trolley bags at this store is perfect. I think these would work great at Aldi as well because they don't give bags out. They are sturdy and strong. You know they won't rip on you while going into the house. The different sizes are good for sorting grocery items. I like that they have velcro and stick together because I lose items all the time. They come in 2 color choices. Where to buy? Check out their website shop here. I think I've seen these before. Curious if these can hold all of your groceries or if you need more than one set? I love this! The ability to sort your groceries and prep for checkout while using cloth bags is a HUGE win! Ooh, those are cool! I love that you are able to scan your groceries as you go! Do you also get an updated total with each scan? ?